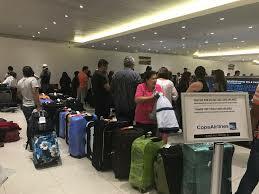 Copa Airlines passengers traveling from Panama to and from North America - Ecuador, Colombia; and to all f Panama to regions, will be able to transport a bag of 23 kilograms free of cost but from May 1 will have to pay $40 for the second suitcase of up to 23 kg. The charge for the second suitcase will be applied exclusively to passengers traveling in the main cabin. Tickets purchased with Full Economic rates (Y, B, M) are exempt and can carry 2 bags of 23 kg each free of charge. PreferMember passengers and passengers traveling in the Executive cabin will keep their current baggage allowance. Copa is one of the last to offer 2 bags let alone 1 bag. AA charges for all but I get one bag with the credit card. As usual, the less affluent passengers will be hit with the extras fees, while those who can most afford it will be given the break. That's a good way to create hostility and shoot yourselves in the foot. If a person can travel from anywhere in the world, on any other airline, with the allowance of 2 pieces of luggage, only to get bottlenecked by Copa restrictions on the last leg of the journey, that will not be a positive experience. That will leave passengers angry and forever impress them that Copa is a predatory provider.